Change is under way for the world’s biggest coal consumer; consumption in 2014 was down. Renewables are up. Coal-fired power plants are working at less than full capacity. A chapter from the Coal Atlas. China burns more coal than any other country. In the 15 years since it became the workshop of the world and developed a booming domestic market, its consumption of coal has doubled. Between 2010 and 2014 alone, China built new coal-fired power plants capable of generating 228 gigawatts – three times more than Germany’s total electricity consumption. Because of its dependence on coal, China now emits significantly more carbon dioxide than the long-time number-one climate offender, the United States – though it still churns out less of the greenhouse gas per person. 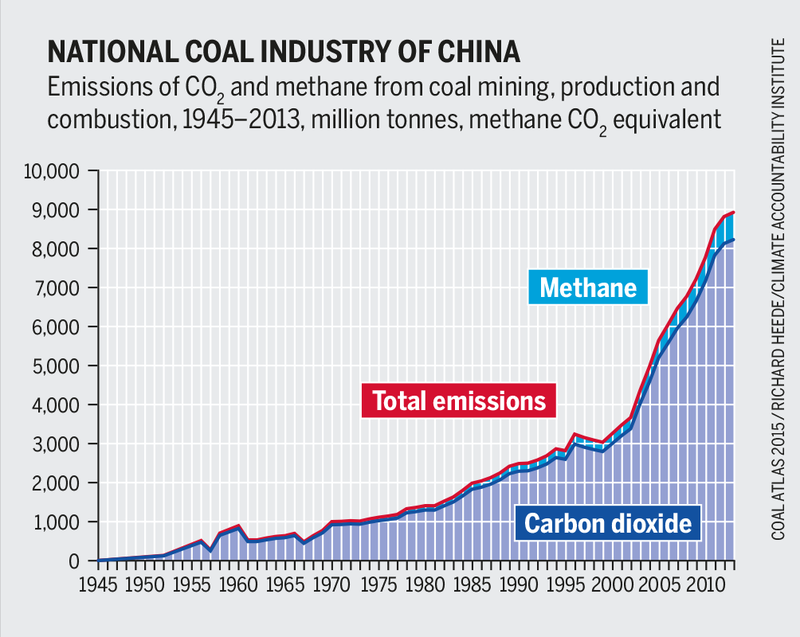 Counting the cumulative emissions since 1990, China is now on the verge of overtaking the USA. But 2014 was different. 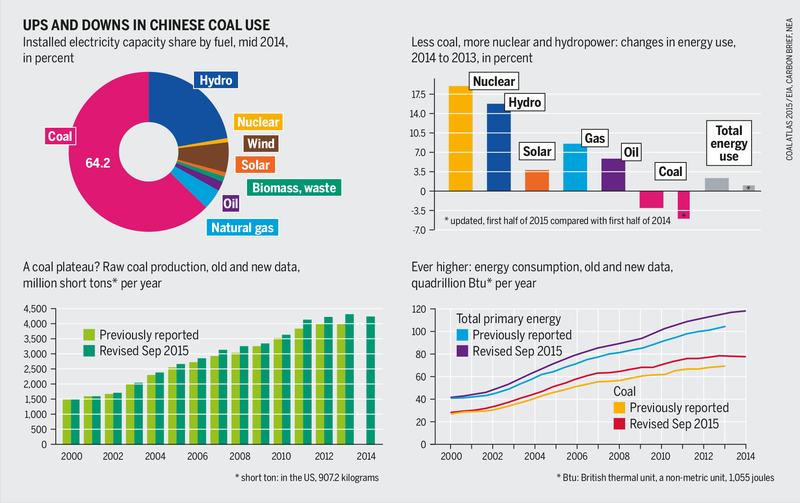 For the first time in over three decades, China burned less coal than in the previous year. Consumption declined by 2.9 percent, and imports slumped by around 11 percent. Not long ago, the International Energy Agency predicted that both figures would continue to rise until 2020. Despite the decline in coal, power consumption was up by 3.8 percent, and the gross domestic product rose by more than 7 percent. It is unclear whether this decoupling is a blip or a turning point. The decline in consumption did not just happen. The government wants to reduce the use of coal for various reasons. The most important reason is the smog that blankets Chinese cities causing asthma and boosting the risk of cancer. The Chinese people, and especially the emerging middle class, are becoming increasingly irritated. Released in 2015, the documentary “Under the Dome” by journalist Chai Jing, focuses on widespread air pollution, and has attracted attention. Over 150 million Chinese watched this film within just three days. It has since been censored by the authorities. In the face of widespread dissatisfaction, cities have been switching off their older coal power plants and dozens of provinces have decided to reduce their consumption. 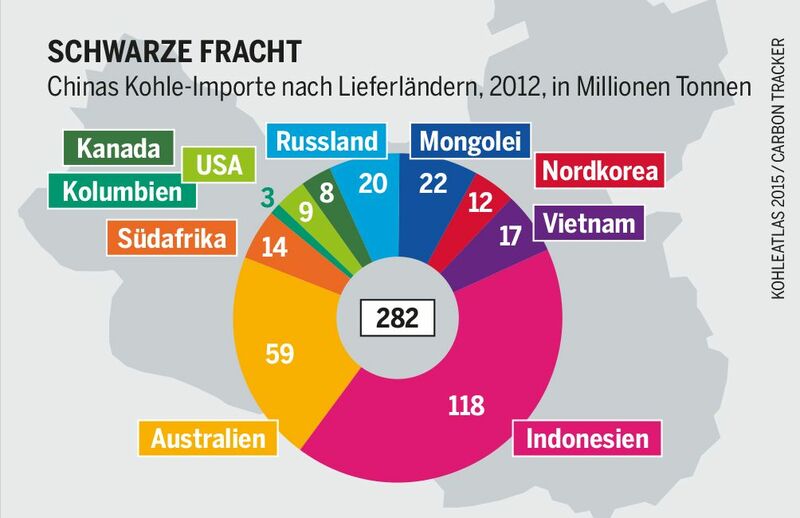 A planned national market for CO2 pollution rights strives to support such efforts. These may make the goal of the “Energy Development Strategy Action Plan”, which aims to reduce the share of coal in the total energy mix to below 62 percent by 2020, down from today’s official 64.2 percent, possible. The national government is also pushing for the rapid expansion of renewable energy. By 2020, non-fossil energy sources, including nuclear, will account for 15 percent of primary energy consumption; by 2030 their share should rise to at least 20 percent. Meanwhile, no other country is investing as much in hydro, wind and solar power; in 2014, China spent about $90 billion on these power sources. Such investments are not without controversy. Big hydropower projects have been criticized for their negative impacts on the environment and for serious human rights violations. The construction of the Three Gorges dam alone forced the resettlement of almost 1.5 million people. Compared with the previous year, China boosted its installed wind capacity by 26 percent and solar capacity by 67 percent. That has lead to a decrease in coal production. In 2014, the coal-fired plants produced 1.3 percent less power than in the previous year; on average they are now only running at 54 percent capacity, the lowest level for three decades. China’s coal sector is now suffering from serious overcapacity. That is one reason why several planned coal projects have been halted in recent years. Falling prices, a ban on especially dirty types of coal, and more stringent environmental requirements have depressed the profits of mining outfits. Three out of four Chinese coal firms have reported losses recently. In the last four years, almost 6,000 coal mines have had to close down. By the end of 2015 another 2,000 mines will padlock their gates. Yet as mining companies are yielding to financial and political pressures, other firms are still planning new coal-fired power plants. 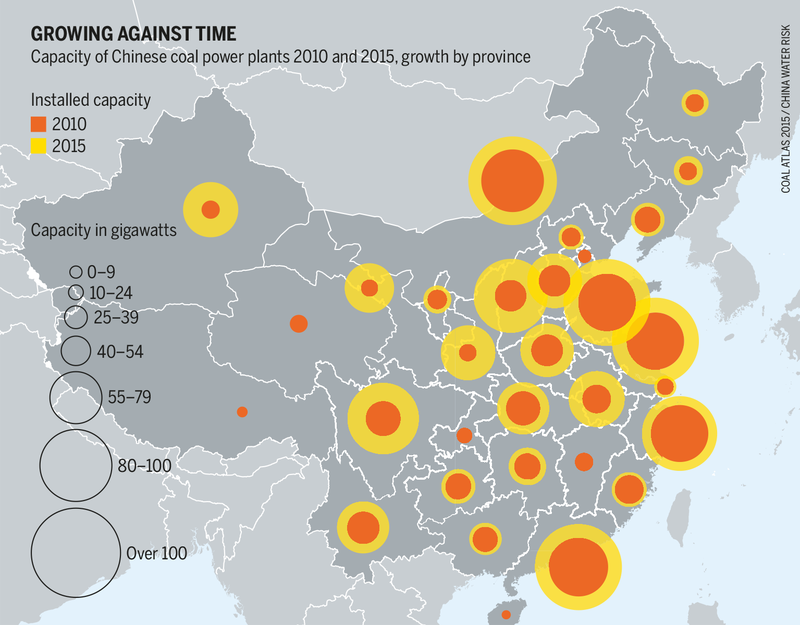 Experts warn of an investment bubble caused by an overcapacity in power generation, because still more new plants are being planned that might go unneeded. The value of companies with extensive coal reserves will undergo a correction on the stock markets as their reserves lose value. That will have knock-on effects on related sectors, on major investors, and on banks that have invested in coal firms or have outstanding loans to them. If the Chinese coal bubble bursts, it will threaten not only the country’s own financial situation but also the rest of Asia. The big Australian and Indonesian coal exporters, which are oriented entirely to the Chinese market, will quickly feel the pain. The Chinese government has started to treat coal critically and is ushering in an era of renewable energy. That is a strong signal for the rest of the world. Because China stimulates the mass production of modern facilities, their cost will fall. Strange as it may seem, it is the country with the world’s worst pollution that is leading the global energy turnaround. Although coal production is still on the rise, the sector is employing fewer people. Structural change has spread to all continents. Nevertheless, mining underground remains one of the most dangerous occupations worldwide.